by Guest Blogger, Liz Savage Tiger Woods announcedthat he will sit out the US Open next month, deferring his quest to beat Jack Nicklaus’ record of 18 major titles while Woods recovers from back surgery to repair a pinched nerve. Woods is the latest in a long line of elite golfers, including Nicklaus who have been debilitated by back pain. In fact, a study of PGA golfers found that 33 percent had had low back problems lasting at least two weeks in the past year. Back injuries in pro golfers typically associated with years of twisting and contorting the spine, required in order to whack the ball with enough force to drive it 300 yards. 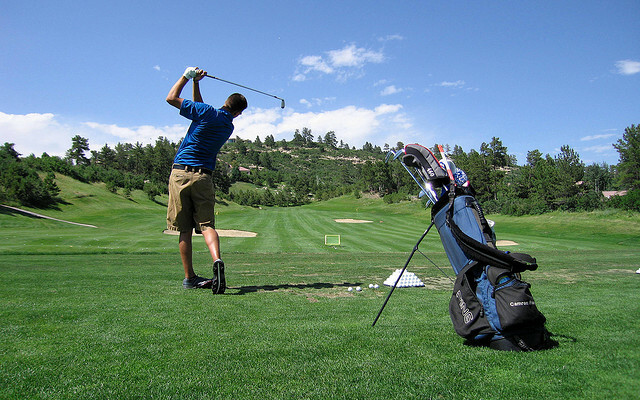 The power behind these swings is immense—a pro golfer’s swing can reach speeds of over 120 miles per hour. Amateurs are also at risk of back injury—though sloppy technique and a general lack of fitness are more often the culprits here. As amateur sports go, in terms of fitness, golf has a lower barrier to entry. You don’t need to run laps or lift weights , or even be vaguely in shape to play a round of golf. But this seemingly low-risk sport can actually put a lot of strain on your spine—compression loads of as much as eight times your body weight, according to one estimate. The perception of golf as a low-risk sport, or a leisure pastime means that many golfers fail to take proper precautions to protect their backs. Here's what you can do to avoid injury on and off the links. The simultaneous twisting and side bending during a golf swing has a wince-inducing name—the “crunch factor”—and researchers theorize that the higher the crunch factor the greater the risk of back injury. You can minimize side bending by adopting the “classic” golf swing, instead of the modern swing. The modern swing, though more powerful, is much harder on your back. This swing involves more turning of your shoulders than your hips, generating more power through greater torque in your back. The swing begins in flexion, bent over the ball, and ends with your back in a reverse “C” position, where your lumbar spine in extension. In the classic swing, on the other hand, the hips and shoulders rotate together with a flowing movement through the swing, and you end the swing in an upright standing position. You might consider taking lessons with a golf pro to master the classic swing. Golfers with poor technique tend to overcompensate with more force. A golf instructor can help correct your form, which will minimize back injuries. Though golfers are more likely to saunter down the fairway than sprint, warming up before you play is still important. Go for a short walk around the course, then do some gentle stretches before you step up to the first tee for a few easy practice swings. Studies have shown that even 10 minutes of warm-up is associated with fewer injuries. Try these golf stretches from the Mayo Clinic. A golf swing involves powerful trunk rotation that places great strain on the spine and surrounding muscles. When these muscles are weak, back injuries are more likely. Stronger core muscles will also give more power to your swing. Try these core-strengthening exercises for golfers. Squat down with your legs to pick up the ball or your golf bag, instead of bending over. If you carry your golf bag, consider it your responsibility to also work out with weights during the week. And carry a bag with two shoulder straps to balance the load on your back. But keep in mind that golfers who shoulder that load on weekends and do no other strength training are more likely to injuretheir backs, shoulders, or ankles. Make sure that your clubs are the right length for you. Too-short clubs force you to hunch over. Peter O'Sullivan, from Australia, is one bright physiotherapist. I first encountered him when I was trying to figure out what had gone wrong with Tiger Woods' back. Here he shares his thoughts on Woods' likely odds in the 2014 PGA tournament.